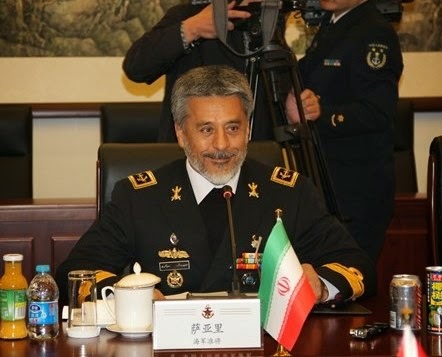 Beijing, Oct 23, IRNA – Commander of Iranian Navy Rear-Admiral Habibollah Sayyari said on Thursday that the Chinese officials are interested in cooperation with Iran in various fields, especially in marine area. Talking to reporters after a meeting with the Chinese defense minister, he said that the country favors collaboration with Iran in military and marine spheres. Sayyari, currently on a visit to China at the head of a high-ranking delegation at the invitation of his Chinese counterpart inspected the Chinese military and marine facilities. Both sides underlined the need to promote military and marine cooperation, he noted. Sayyari pointed out that historic bilateral ties and the two countries' role in regional and trans-regional decisions were dealt with in the meeting with Chinese Defense Minister Chang Wanquan and Navy Commander Admiral Wu Sheng Li. Chinese officials underlined cooperation with the Islamic Republic of Iran in defense sector and reciprocal visits by the military commanders, he said.